ARLINGTON, Texas — The Rangers’ game last night apparently wasn’t the hottest ticket in town. Texas’ 6-3 loss to Los Angeles occurred before the smallest home crowd in nearly five years, reported Evan Grant of The Dallas Morning News. 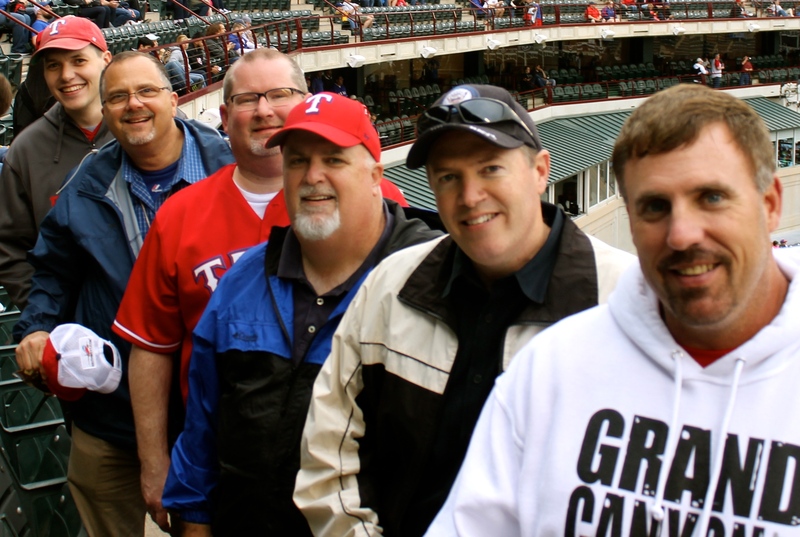 With friends at last night’s Rangers game in Arlington, Texas. There were Angels in the outfield but not too many fans in the bleachers, as the Monday night game drew 18,401 fans to Ghost Town Park — er, Globe Life Park — in Arlington. Why the small crowd? Weather probably played a role, with rain in the forecast and temperatures in the low 60s. The Rangers’ injury situation — including the loss of key pitchers Yu Darvish and Derek Holland— has hurt confidence in the team’s chances. Moreover, even if the weather were perfect and the team on a winning streak, weeknight games during the school year tend to draw fewer fans than usual. But for the baseball faithful who made it to the ballpark — including a group of friends and me — last night’s game was a wonderful experience. 1. Sit on the front row for nosebleed prices. This time of year, you can usually find terrific deals for weeknight games at StubHub.com. My friends and I bought seven tickets for $11 each — and we were seated on the front row of the third deck. Yes, we were up a little high, but we had an excellent view of home plate and the entire field. Tonight, my son Keaton and I will sit on the ground level just a few rows from third base for $29.25 each. Those lower box seats start at $69 on the Rangers’ official website, so we paid less than half the normal price. Keaton, my dad and I got a similar deal for tomorrow afternoon’s game. 2. Stretch your legs and buy new snacks between every inning. When the ballpark is filled with 48,000-plus fans, buying a hot dog or nachos — or using the restroom facilities — can be a pain. Everywhere you go, there’s a long line. And you generally can’t go anywhere without missing an inning or two of the game. But last night? There were no lines. There was plenty of time between innings to enjoy all the new concessions, make a pit stop and slide back into your seat before the Dot Race was halfway done (Blue beat Green and Red, by the way). 3. Adopt your own row. Face it. They don’t build major-league ballparks with a lot of arm and leg room. But last night, everyone who wanted could choose their own row. Want to stretch out or lie down? Go for it. Tired of people and want to watch the game all by yourself? Pick your own section and climb to the top row. Pregnant and want to bring two people to the game for the price of one? No problem. 4. Bask in your fan superiority. When the team starts rolling again and postseason baseball returns, the fair-weather fans will jump back on the bandwagon. But when that happens, you can remind everyone that you were rooting for the home team when everybody else was afraid of a few showers and a sputtering offense. For a baseball fan, the size of the crowd doesn’t matter. Whether there are 50 fans or 50,000 in attendance, the true fan knows that once-in-a-lifetime magic can happen on any given night. Even if it doesn’t, the experience of enjoying a game with family and friends can’t be beat. Yes, it’s more exciting if your team wins. But even if they don’t, it’s a whole lot of fun. Tonight, it’ll be baseball time in Texas once again. Your turn: What ideas do you have for enjoying major-league baseball in a nearly empty ballpark? Tweet me @bobbyross. Next Studies in ethical fandom: Is it ever appropriate to leave a major-league baseball game early?